Turkey is a must at Thanksgiving! But who wants to buy an entire turkey for only two people? It is just to much food and such an expense. This quick and easy dish will solve all your problems. If you wish, you can purchase a much larger turkey breast in order to have leftovers. Just remember the cooking time will increase as well. Preheat oven to 350 degree Fahrenheit. Heat saute pan until oil shimmers and smokes. Add turkey breast skin side down. DO NOT TOUCH for 3-4 minutes and repeat on other side. Transfer turkey to sheet pan. Place in oven and bake 5-7 minutes or until the internal temperature reaches 165F. Add wine to deglaze the pan. Reduce by wine half and add onions. 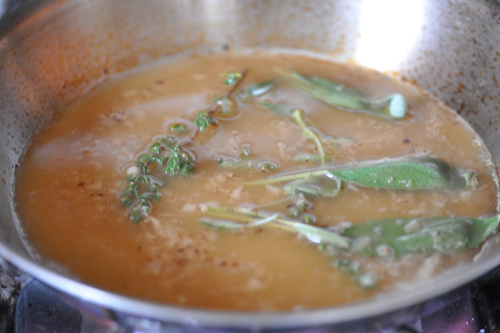 Next add broth, thyme, sage, salt and pepper and cream. 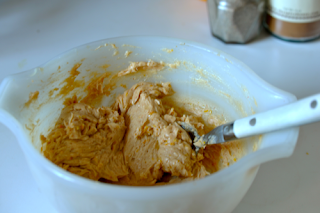 Reduce by about half or until it coats the back of the spoon. Serve with Turkey. 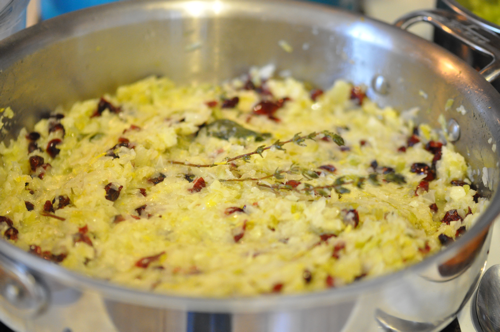 Don't forget these classic sides: Stuffing with Dried Cranberries and Herbs and Herbed Infused Mashed Potatoes. I can't imagine a Thanksgiving that didn't have mashed potatoes on the menu. Every year I would help my mom make them in the kitchen with our hand mixer or potato masher. 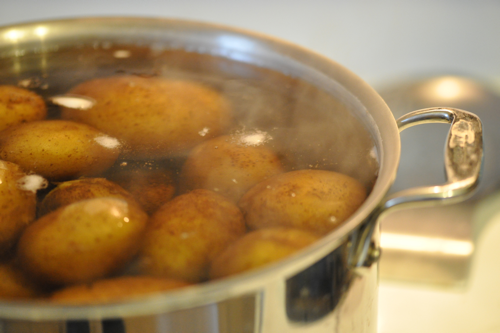 They were very simple, milk, potatoes, salt and pepper. 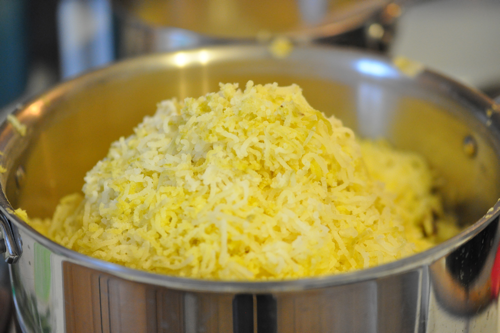 Then one year, we decided to use a ricer to make this delectable side. The resulting mashed potatoes were light and airy. I haven't made them any other way since. This technique makes a huge difference in texture. It prevents you from getting that gluey mashed potato. The best part is a ricer only costs 5 or 10 dollars. Which is not much to pay for perfect mashed potatoes! 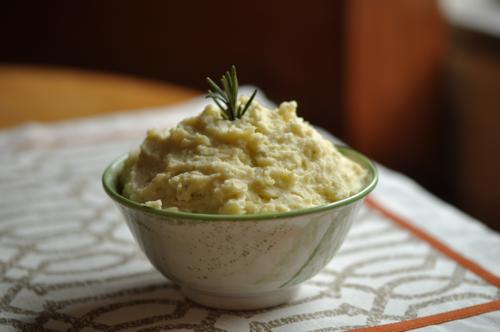 So enjoy these mashed potatoes and change it up with any herbs you'd prefer or have on hand. 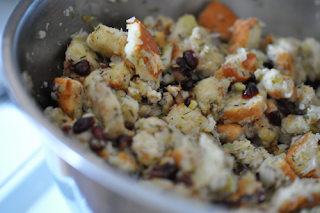 This stuffing recipe has become somewhat legendary in my house hold. It has been perfected over the years. I usually quadruple it so there is enough leftovers. This stuffing even gets better the next day. I know this recipe seems strange without dried bread. 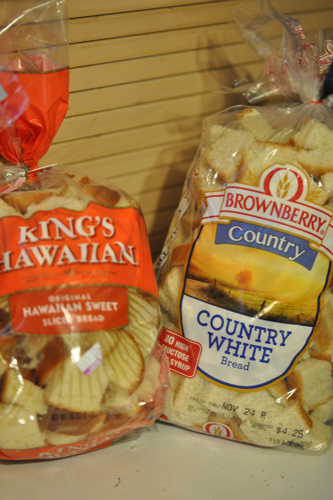 I have found that stale bread absorbs too much liquid and makes it incredibly soggy. If you prefer your stuffing that way, then add more broth. 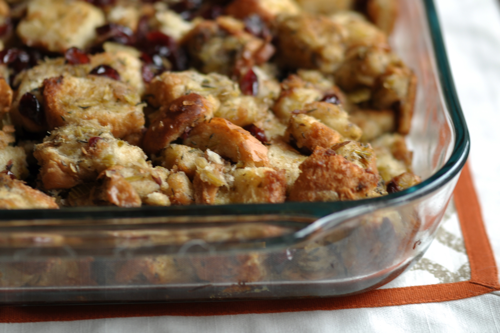 Once you try this stuffing, you will never go back to anything else! Preheat oven to 350 degrees Fahrenheit. Melt butter over medium heat. Add onion, celery, thyme and sage. Let cook 10-15 minutes covered or until tender. 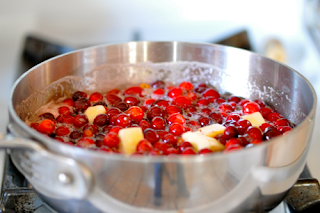 Add dried cranberries and cook another 5 minutes covered. 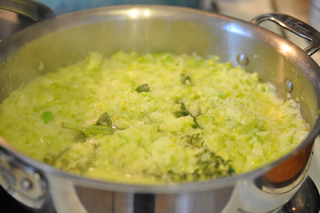 In very large bowl, combine bread and onions, celery, and cranberry mixtures. 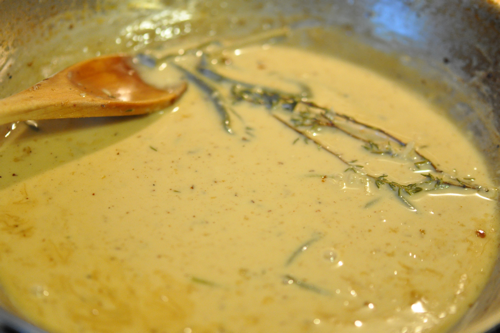 Gently mix and add broth, dried thyme, powdered sage and salt and pepper to taste. Cook stuffing in 9x13 dish covered with aluminum foil for 30 minutes. Turn oven up to 400 degrees Fahrenheit and bake 15 minutes more or until golden brown. Enjoy this stuffing! I guarantee you won't forget it! 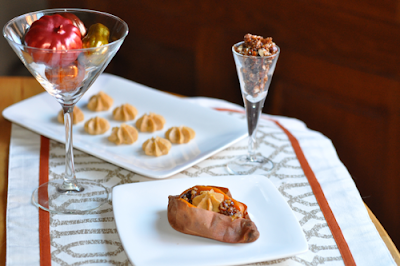 A new spin on a Thanksgiving favorite! Cranberry sauce is a classic for the holiday feast. I don't know anyone that celebrates with out it. I know this is not the jellied can stuff, but it tastes exceedingly better. 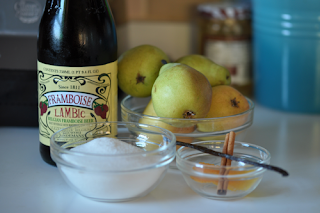 I wanted to put a spin on the classic version, so changed it up a bit with using the lambic. Apple cider maybe used, if you don't want the alcohol. I encourage you make this dish for your Thanksgiving feast. It's a very easy dish to make and tastes wonderful! Combine all ingredients in sauce pan except ground cinnamon. Bring to simmer and boil for 10-15 minutes. After it is done cooking add ground cinnamon and stir to combine. Remove cinnamon stick and allow to cool before serving. Baked potato or gourmet side? Sweet potatoes are a nutritional power house in the kitchen. They contain high amounts of Vitamin A&C, B6, Potassium and Manganese. Plus, they are easy to bake and add great color to any plate. Normally, a baked potato is not a stunning side dish. This recipe brings them to an entirely different level. The piped compound butter and maple pecans elevate this dish. It makes a gourmet presentation. 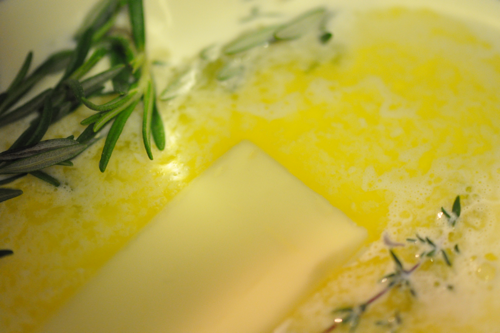 Keep the compound butter in the freezer for future use. The pecans can be used on salads, cheese plates, or eaten as a snack. For another plating option, you could scoop out the flesh of the potatoes and combine it with some of the butter. Then place in a casserole dish. 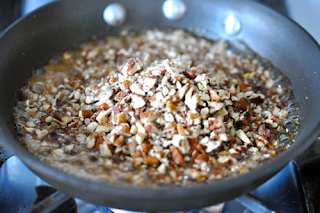 Heat up and top with pecans before serving. 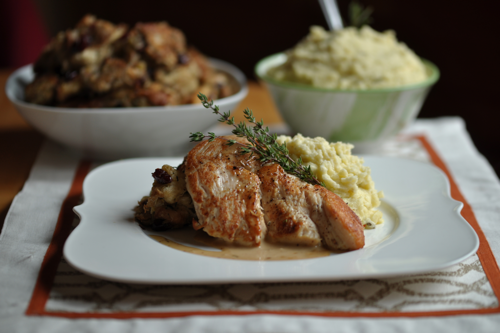 This would make an excellent dish to prepare for Thanksgiving day! Preheat oven to 400 degrees Fahrenheit. Place potatoes on parchment lined sheet tray evenly apart. Cook for 1 hour or until soft when pierced with a fork. Combine butter, spices, salt, zest and juice. Then either pipe on sheet tray or place in saran wrap and form into a roll. 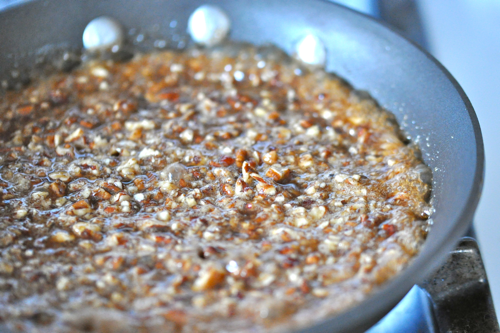 Bring maple syrup up to a boil. Then add pecans. 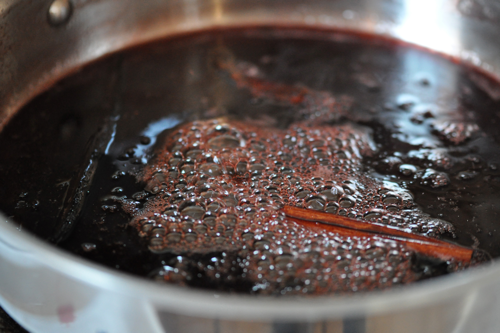 Cook until thick and syrupy about 3-5 minutes. 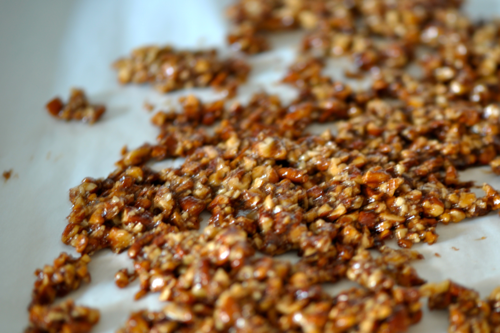 Place on a parchment lined sheet pan and let cool. Break apart and store in cool dry place. Tip- Compound butter is a a butter that has spices, herbs or even fruit added. This adds extra flavor and the combinations are endless. It is often used as a sauce on steaks or fish. I encourage you to experiment with this in your own kitchen! 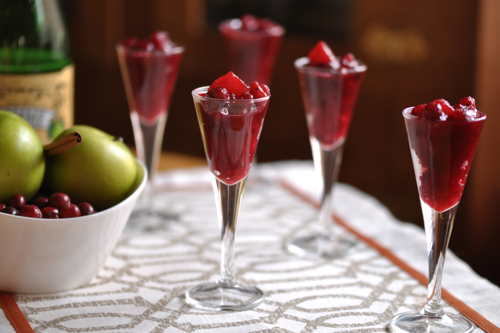 An elegant dessert that's perfect for entertaining! 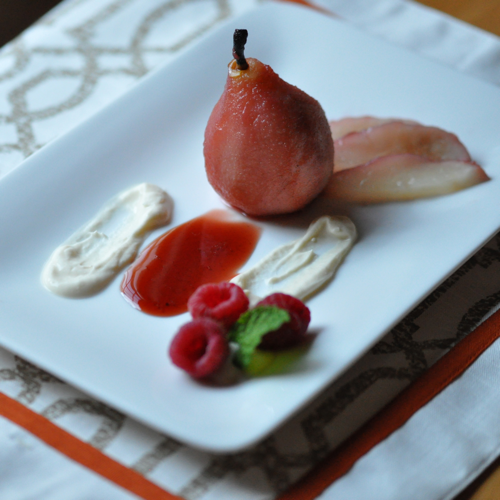 Poached pears are an elegant dessert that can be made ahead of time. Therefore, it's wonderful for entertaining. Just make the pears the day before and let it sit overnight to chill. When your guests come over, impress them with this beautifully plated dessert. As well as being an exquisite dessert, it sneaks in some nutritional benefits too. The amount of calories in poached pears is far less than the average dessert. They are high in fiber, vitamin C and potassium for a nutrient boost. Enjoy this dessert without all the guilt. 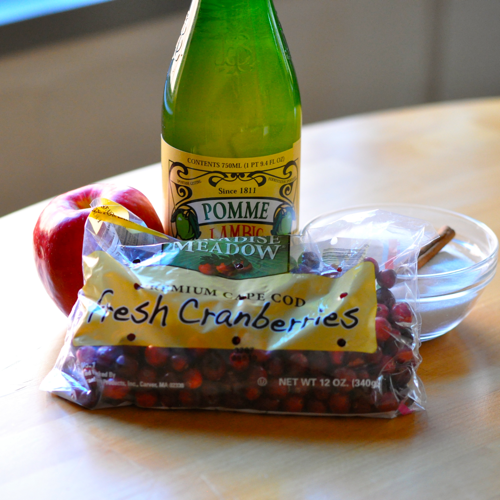 Combine lambic, sugar, vanilla, bean, orange zest, cloves, cinnamon, and cranberry juice in sauce pot. Cook until sugar dissolves and mixture simmers. Add pears and simmer pears 20-25 minutes or until tender. Make sure to immerse all sides of pear in liquid to color evenly. Remove and let cool. 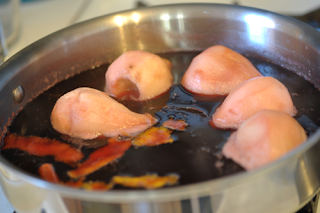 Meanwhile reduce the sauce until thick and syrupy, about 20-30 minutes. 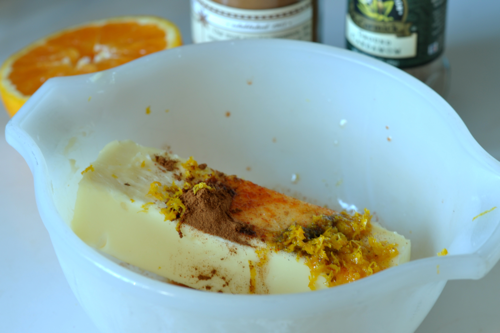 Remove cloves, cinnamon and vanilla bean. For creme fraiche, combine it with powdered sugar, cream and vanilla. Slightly whip with whisk. Plate with raspberries, mint, creme fraiche and reduced sauce. 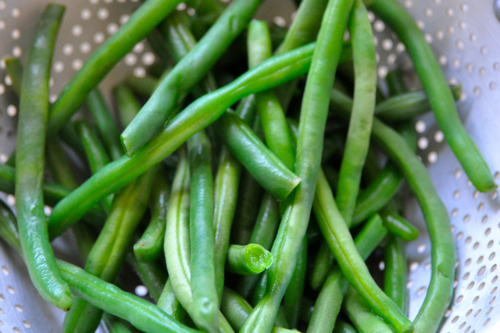 Green beans and Thanksgiving are like peanut butter and jelly. It's hard to have one without the other. Instead of the canned green bean casserole, give this a try. This dish is healthier than the original. It lacks all the preservatives and sodium, which provide off flavors and aftertastes. It is sure to impress your guests and it can be elevated to another level with homemade onion straws for garnish. When making it for company, blanch the green beans first and store in the fridge. On the day of the big event, saute the mushrooms an add your green beans to the mix. Steam green beans until al dente or they still have a little crunch. Cool rapidly under cold water. Set aside. 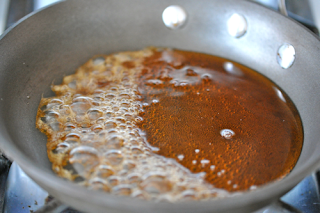 Heat 1 tablespoon oil and butter in skillet until smoking. Add mushrooms and do not stir for 2-3 minutes. 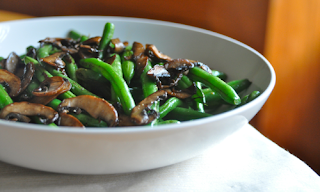 This creates a caramelization on the mushrooms, which gives a great boost of flavor. 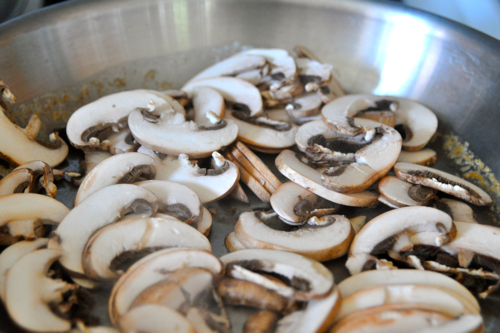 Once caramelization has occurred, stir your mushrooms and continue to cook until soft. Season with salt and pepper. Set aside. 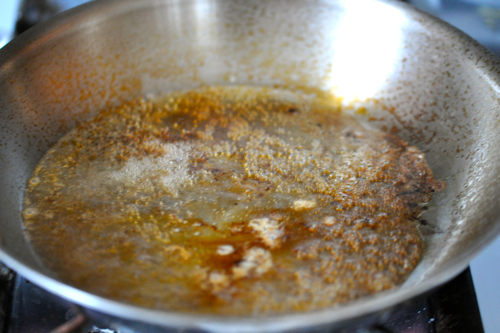 Heat remaining tablespoon of grapeseed oil until smoking. Add green beans and saute until heated through. Add mushrooms and season.